Sometimes when you or your child have a cold or something minor, a trip to the doctor is the last thing that you want to do. I know that sitting in a waiting room for hours is not what I would want to do or subject my child to. Amwell has the answer. You can see a doctor in the comfort of your own home through the Amwell app. I was very lucky to get a chance to try out this wonderful service. I had an annoying rash which I really didn't want to go to a doctor's office to treat. I signed up on the Amwell app which was quick and easy. I set up my profile, added some health information, and was given a list of doctors who were available for a visit. I chose Dr. Wiita and was put into a waiting "area". Within a few minutes Dr. Wiita appeared on my screen. I sent her a picture of my rash beforehand so we discussed the picture, my symptoms and her impressions. She asked many questions and was extremely thorough in her discussion with me about what her diagnosis was. She then told me what medication I needed and said she would send the prescription to the pharmacy of my choice. My pharmacy received the prescription quickly. The whole visit lasted less than ten minutes. I think it was very informative and was happy with how it turned out. You have an option to receive a summary report of your online visit which is very detailed in case you missed something during your visit. 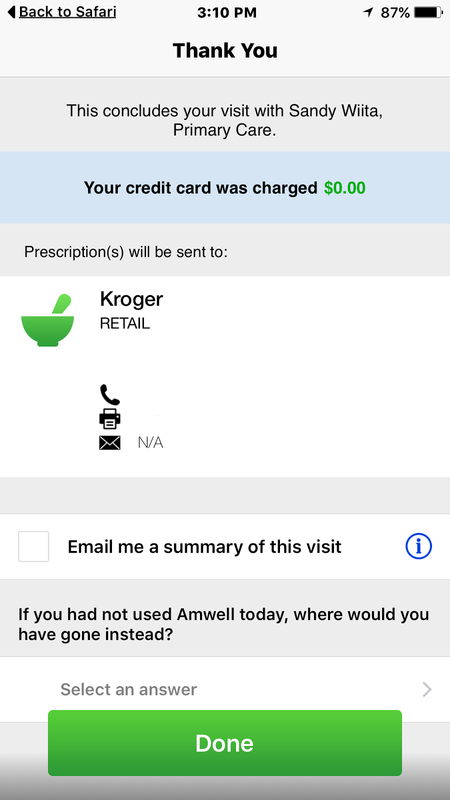 So if you have something like a cold or rash, Amwell makes it very easy to see a great doctor without having to leave your home. This app is particularly helpful for moms because you don't have to bundle your little ones up and make them sit in a doctor's office which makes them feel worse. I am very happy to say that Amwell is offering my readers a free visit with coupon code CARENOW15.